Purpose ReDesign Studio is making a lot of buzz in and around Tallahassee’s DIY artistic community. Why just last month Purpose was featured in the before/after section of the popular blog Design*Sponge. Purpose guru Suzi Mojock approached me several months ago about logo development and branding. The initial design concept was the brainchild of Chris Mojock, Suzi’s husband. They brought the idea to me scribbled on a cocktail napkin. It only took a couple of days for Suzi and I to refine the look to what you see here. Out of the kindness of her heart and the need to clean out an overflowing garage, Katie Wright, owner and stylist extraordinaire at Tallahassee’s Green Peridot salon, gave yours truly three beautiful Parsons chairs. Furniture refinishing/refurbishing used to be a hobby of mine, way back when I had time to have hobbies. I had this great vision to transform those three Parsons chairs into a cushy headboard, so that reading and drinking coffee in bed would be more comfortable. Well not too long after I got those chairs, I started working on my Masters in Education Media Design and Technology, which left little time for sleeping, reading or hobbies beyond academia. For nearly a year those Parsons chairs sat collecting dust in any already crowded closet. When I heard about my friend Suzi’s new adventure with Purpose, I donated the chairs to her creative crusade. 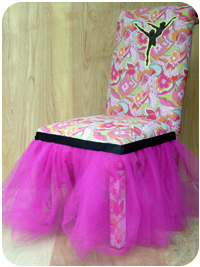 Just a few short weeks later, the Tutu Chair was born… and just a few days later it SOLD. Did I mention that Suzi also works at the Green Peridot… which was where this story began. Tallahassee is overflowing with good friends and good will. You don't need to look far to find it.